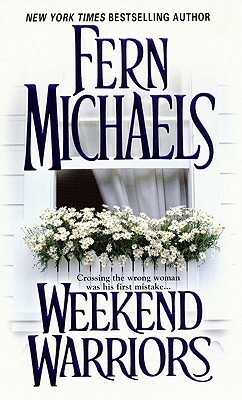 In the words of my non-existant Jewish grandmother, oy vey…where to start…looking back over my reading history, I don’t know if I had ever picked up a Fern Michaels book before, but after listening to Weekend Warriors, I can tell you for certain that I won’t be picking up one in the future. Whoever classifies this book as a romance has some serious delusions – there is nothing romantic about male castration as a form of revenge (yes, this is completely spoiler-ish and I don’t care). I didn’t see one whit of romance in any of the going-ons in this book. I would more accurately describe it as revenge based women’s lit and not even good on that account. Thankfully, it was only 6 hours long in audio format (so about 220 pages and I managed to listen to most of it in just over 2 days – this is one time that I wasn’t too mad at my long commute because I could simple tune out when needed). If I hadn’t had this scheduled into several different reading challenges, I might have even DNF’d it – but since I did, I persevered. I wish I could say that the narration helped to improve on a bad book, but unfortunately, that wasn’t the case either. I’m not sure if I have ever listened to anything narrated by Laurel Merlington before, and am not sure if I will seek her out again in the future. Maybe if it were for a book by a favorite author, but I wouldn’t listen to anything by an unknown author and narrated by her because in general I struggled. Yes, she was a competent narrator, but it just seemed like there was something missing. I had a hard time visualizing the different characters in my head because there didn’t seem to be much vocal differentiation between them – and when you have a cast of 10 women, 5 of whom are fairly dominate that is something that is needed. I know that I could not recommend the author, and would hesitate to recommend the narrator to anyone. But that being said, I would be more inclined to give the narrator a second chance than the author…overall, 1 star for the book, 2 stars for the narration – 1.5 stars overall.